Our article about web-based self- and peer-assessment of teachers’ digital competencies has been recently accepted for publication in the World Wide Web Journal special issue on Advances in Multimedia e-Learning Technologies. The article is a revised version of a paper presented that we presented at the ICWL 2011 conference. It has been extended by a description of the software implementation and a validation study. We have now completed the first working prototype of DigiMina tool for assessing teachers’ digital competencies. This tool and initial set of assessment tasks were evaluated with a group of teachers. At the moment we have still covered only 20% of competencies with assessment tasks. Therefore we cannot open the system for a wider audience. This autumn we will continue with creating the assessment tasks and improving the usability of the system. I am planning to include this article in my dissertation instead of an earlier paper that was presented at the ICWL 2011 conference. 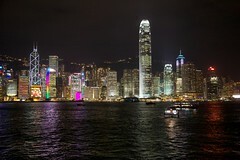 Last week I participated the International Conference on Web-based Learning (ICWL 2011) that took place in Hong Kong. Three conference papers and one workshop paper were accepted from our research group, so I travelled with my colleagues Mart Laanpere and Vladimir Tomberg. I was presenting our work on assessing teachers’ educational technology competencies and the conceptual design of DigiMina environment. As a nice surprise, our paper received the best student paper award. Põldoja, H., Väljataga, T., Tammets, K., & Laanpere, M. (2011). Web-based Self- and Peer-assessment of Teachers’ Educational Technology Competencies. In H. Leung, E. Popescu, Y. Cao, R. Lau, & W. Nejdl (eds. ), Advances in Web-Based Learning – ICWL 2011: 10th International Conference, Hong Kong, China, December 2011. Proceedings (pp. 122–131). Berlin / Heidelberg: Springer. The conference papers covered wide variety of topics. I would like to point out a few of the presentations from the sessions that I attended. Elvira Popescu was presenting eMUSE platform that aggregates learner activities from several social media media tools (Blogger, MediaWiki, Twitter, Delicious, YouTube, Picasa, SlideShare) (preprint). This is very close to our work in EduFeedr project. Adriana Berlanga was presenting a paper co-authored with Riina Vuorikari and a group of researchers in TellNet project (draft). They were studying the eTwinning community and presented some interesting statistics. It was nice to see that Estonia has the largest percentage of teachers involved in eTwinning activities (9,74%). It would be good to have a similar study about LeMill community, but unfortunately we have detailed data only about those users who have filled up their profiles. In the KMEL symposium my colleague Vladimir Tomberg presented the conceptual design of Timeliner tool that supports collaborative scientific writing (presentation). It is nice to see that they have made an in depth design process and we have something to offer also in the research 2.0 field. However, I still think that often the main problem in collaborative writing is lack of time, not lack of tools. I would have expected a little bit more active use of the web in the conference. It seems that I was the only one using #icwl11 hashtag in Twitter and I have found only a few presentations from SlideShare so far. I had also some time to look around, take photos and enjoy asian food. First photos are up in Flickr and more will follow during the Christmas break. 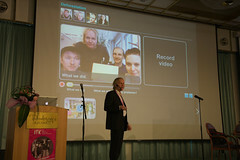 Two weeks ago I participated the ITK 2011 conference in Hämeenlinna. This is the largest e-learning conference in Finland with approximately 1600 visitors. For me it was fifth year in a row to participate ITK conference. My main aim was to present EduFeedr to Finnish audience. As more educators are trying to use blogs and social software instead of a learning management systems, tools like EduFeedr become handy. There have been 19 active courses and several more tryouts in EduFeedr since we launched the beta service last September. The best example in English is New interactive environments, but the largest course is actually in Spanish (Innovación abierta en la gestión de proyectos culturales with 61 participant blogs). In addition to English (2) and Spanish (2) we have courses in Estonian (11) and Finnish (4). Here are my abstract and presentation slides from ITK. We planned to release a version 0.6 before the ITK conference but unfortunately we didn’t manage to do that. The main features that we have planned for EduFeedr 0.6 are described in EduFeedr blog. On the second day of ITK we had a joint video conference session with Estonian e-learning conference that took place in Tartu. From the Estonian side my colleague Mart Laanpere was talking about the development of digital learning resources by vocational and higher education teachers (PDF). From the Finnish side Ville Venäläinen and Tarmo Toikkanen presented the Sometu network. Twitter hashtag #itkesitys178 was used for short comments from the participants in both sides. Most inspiring presentation for me was the keynote speech by Pierre Dillenbourg. He presented several “modest computing” experiments where they used simple physical objects with simple sensors/displays in the learning setting (video). Although I am now able to follow presentations in Finnish quite well I was most of the time in the English session. There were two open education related presentations by Kati Clements and Anna-Kaarina Kairamo. An interesting discussion followed Jukka Huhtamäki’s presentation about the Knowledge Federation initiative. Teemu Leinonen presented three design concepts that our research group in Media Lab Helsinki has developed in iTEC project. TeamUP, PLATES and ReFLEX that are designed for supporting study projects where students work in small groups. These applications help to divide students to small groups, follow their work, manage/share media and reflect on the learning experiences. I hope that next year the Estonian and Finnish e-learning conferences don’t take place on the same days. Then there could be more visitors and presenters from the neighboring country in both conferences.